↑ 1.0 1.1 In state-by-state tallies, Trump earned 306 pledged electors, Clinton 232. They lost respectively 2 and 5 votes to faithless electors. Pence and Kaine lost one and five votes, respectively. ↑ 2.0 2.1 Schmdt, Kiersten; Andrews, Wilson (December 19, 2016). "A Historic Number of Electors Defected, and Most Were Supposed to Vote for Clinton". The New York Times. Associated Press. สืบค้นเมื่อ December 20, 2016. ↑ 3.0 3.1 Leip, David (December 17, 2016). 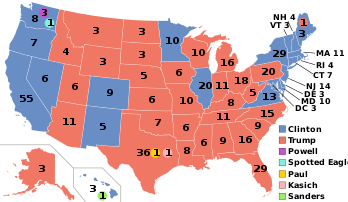 "2016 Presidential General Election Results". Dave Leip's Atlas of U.S. Presidential Elections. Newton, Massachusetts. สืบค้นเมื่อ December 17, 2016. ↑ "Donald Trump is running for president". Business Insider. June 16, 2015. สืบค้นเมื่อ June 16, 2015. ↑ "Donald Trump announces presidential bid". The Washington Post. June 16, 2015. สืบค้นเมื่อ June 16, 2015. ↑ "Donald Trump FEC filing" (PDF). FEC.gov. June 22, 2015. สืบค้นเมื่อ June 24, 2015. ↑ Chozick, Amy. "Hillary Clinton Announces 2016 Presidential Bid". The New York Times. สืบค้นเมื่อ April 12, 2015. ↑ Karni, Annie (April 12, 2015). "Hillary Clinton formally announces 2016 run". Politico. สืบค้นเมื่อ April 18, 2015. ↑ "Hillary Rodham Clinton FEC filing" (PDF). FEC. April 13, 2015. สืบค้นเมื่อ April 13, 2015. หน้านี้แก้ไขล่าสุดเมื่อวันที่ 14 กุมภาพันธ์ 2562 เวลา 09:51 น.